John Stuart Mill was a famous Philosopher from England, who lived between May 20, 1806 and May 8, 1873. He became 66 years old. 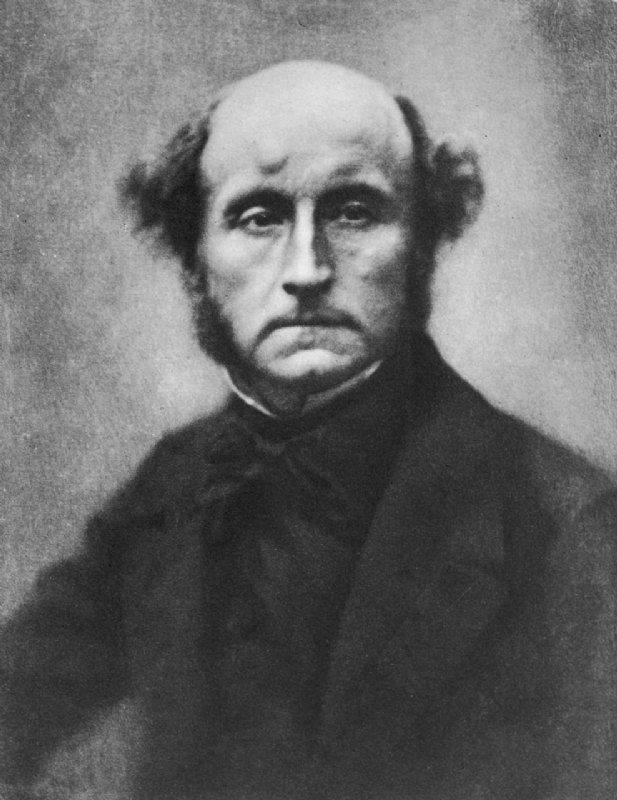 John Stuart Mill (born in Pentonville, London, died in Avignon, France) was an English philosopher who also practiced influence on economic thinking. Mill had a strong influence on the 1800's social liberalism, and political and ethical thinking in general. He was the son of the philosopher James Mill. Philosophical Mill was one that based its thinking on empiricism, a legacy including from David Hume. He was influenced by the utilitarianism of Jeremy Bentham and the social sciences in general and economics in particular. In religious matters he was pronounced anti-authoritarian. Mills work "The Principles of Political Economy" from 1848 became popular textbook, and practiced a great influence on contemporary issues. Mill was a prolific writer and published several books on various topics. The topics that he discussed deals with freedom of nature, the oppression of women as a social problem and a general discussion of contemporary political ideas. He authored some also with his wife Harriet Mill (Harriet Taylor). Mill advocated that morality should be based on human needs for happiness, joy and security, as opposed to the ethics of such a duty. Immanuel Kant. Actions that lead to happiness, is morally correct precisely for the reason that they do, while the actions that lead to the opposite of happiness is morally wrong; actions are thus considered primarily from their consequences, not from the intentions underlie them. He is born under the zodiac taurus, who is known for Security, Subtle strength, Appreciation, Instruction, Patience. Our collection contains 45 quotes who is written / told by John, under the main topics: Happiness, Happiness, Politics. "The disease which inflicts bureaucracy and what they usually die from is routine"
"The most cogent reason for restricting the interference of government is the great evil of adding unnecessarily to its power"
"The only power deserving the name is that of masses, and of governments while they make themselves the organ of the tendencies and instincts of masses"
"The only part of the conduct of any one, for which he is amenable to society, is that which concerns others. In the part which merely concerns himself, his independence is, of right, absolute. Over himself, over his own body and mind, the individual is sovereign"
"The dictum that truth always triumphs over persecution is one of the pleasant falsehoods which men repeat after one another till they pass into commonplaces, but which all experience refutes"
"Life has a certain flavor for those who have fought and risked all that the sheltered and protected can never experience"
"It is questionable if all the mechanical inventions yet made have lightened the day's toil of any human being"
"In all intellectual debates, both sides tend to be correct in what they affirm, and wrong in what they deny"
"If all mankind minus one were of one opinion, mankind would be no more justified in silencing that one person than he, if he had the power, would be justified in silencing mankind"
"I have learned to seek my happiness by limiting my desires, rather than in attempting to satisfy them"
"I am not aware that any community has a right to force another to be civilized"
"He who knows only his own side of the case knows little of that"
"Eccentricity has always abounded when and where strength of character had abounded; and the amount of eccentricity in a society has generally been proportional to the amount of genius, mental vigor, and courage which it contained"
"Conservatives are not necessarily stupid, but most stupid people are conservatives"
"As long as justice and injustice have not terminated their ever renewing fight for ascendancy in the affairs of mankind, human beings must be willing, when need is, to do battle for the one against the other"
"As for charity, it is a matter in which the immediate effect on the persons directly concerned, and the ultimate consequence to the general good, are apt to be at complete war with one another"
"Although it is not true that all conservatives are stupid people, it is true that most stupid people are conservative"
"All political revolutions, not affected by foreign conquest, originate in moral revolutions. The subversion of established institutions is merely one consequence of the previous subversion of established opinions"
"All good things which exist are the fruits of originality"
"All desirable things... are desirable either for the pleasure inherent in themselves, or as a means to the promotion of pleasure and the prevention of pain"
"All action is for the sake of some end; and rules of action, it seems natural to suppose, must take their whole character and color from the end to which they are subservient"
"Actions are right in proportion as they tend to promote happiness; wrong as they tend to produce the reverse of happiness. By happiness is intended pleasure and the absence of pain"
"A person may cause evil to others not only by his actions but by his inaction, and in either case he is justly accountable to them for the injury"
"A party of order or stability, and a party of progress or reform, are both necessary elements of a healthy state of political life"
"Whatever crushes individuality is despotism, by whatever name it may be called and whether it professes to be enforcing the will of God or the injunctions of men"
"What distinguishes the majority of men from the few is their inability to act according to their beliefs"
"We have a right, also, in various ways, to act upon our unfavorable opinion of anyone, not to the oppression of his individuality, but in the exercise of ours"
"We can never be sure that the opinion we are endeavouring to stifle is a false opinion; and even if we were sure, stifling it would be an evil still"
"War is an ugly thing, but not the ugliest of things. The decayed and degraded state of moral and patriotic feeling which thinks that nothing is worth war is much worse"
"Unquestionably, it is possible to do without happiness; it is done involuntarily by nineteen-twentieths of mankind"
"There are many truths of which the full meaning cannot be realized until personal experience has brought it home"
"The person who has nothing for which he is willing to fight, nothing which is more important than his own personal safety, is a miserable creature and has no chance of being free unless made and kept so by the exertions of better men than himself"
"The only purpose for which power can be rightfully exercised over any member of a civilized community, against his will, is to prevent harm to others. His own good, either physical or moral, is not sufficient warrant"
"The despotism of custom is everywhere the standing hindrance to human advancement"
"The amount of eccentricity in a society has generally been proportional to the amount of genius, mental vigor, and moral courage it contained. That so few now dare to be eccentric marks the chief danger of the time"
"That so few now dare to be eccentric, marks the chief danger of the time"
"Popular opinions, on subjects not palpable to sense, are often true, but seldom or never the whole truth"
"Pleasure and freedom from pain, are the only things desirable as ends"
"One person with a belief is equal to ninety-nine who have only interests"
"Of two pleasures, if there be one which all or almost all who have experience of both give a decided preference, irrespective of any feeling of moral obligation to prefer it, that is the more desirable pleasure"
"No slave is a slave to the same lengths, and in so full a sense of the word, as a wife is"
"Men might as well be imprisoned, as excluded from the means of earning their bread"